If you're looking for a weekend trip that combines an ocean boardwalk, street food, carnival rides, and possibly rigged carnival games, look no further than Wolmido Island. It's a ten minute cab ride away from Incheon Station and definitely has enough activities to while away an entire Saturday. I mean, what better way to wind down after a week of teaching English than to hit an arcade and try to win some stuffed animals? The outer edge of the small amusement park on Wolmido. 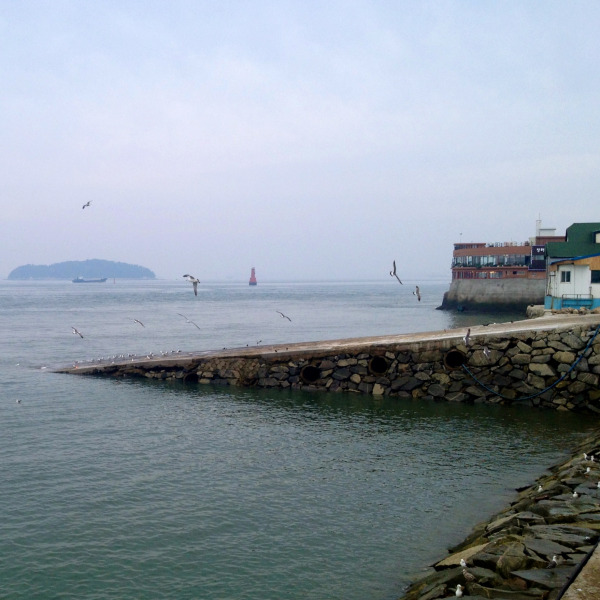 Wolmido is an island just off the coast of Incheon, and in 1989, it was connected to the mainland by a highway, making it very easy to reach. 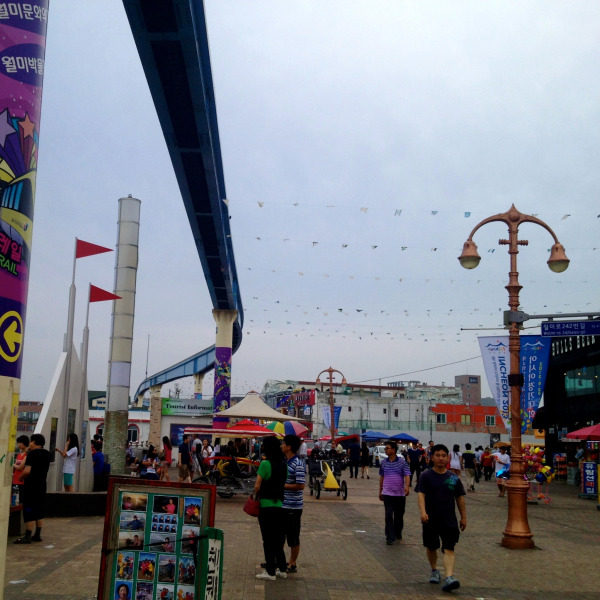 The island has a large park as well as a nice boardwalk, lined with cafes, restaurants, and an amusement park complete with an arcade. Contrary to the gloomy skies (and general vibe of being a little creepy) in the above photo, Wolmido was bustling. 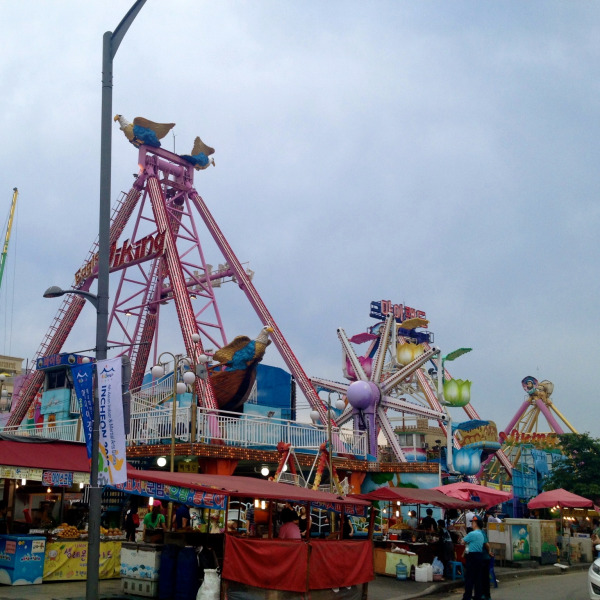 The amusement park area, known as Play Hill, was packed with groups of families and friends, waiting in line for rides and playing arcade games. The island definitely has a family-oriented vibe, and it seemed like the weather hadn't discouraged anyone from coming out to enjoy their weekend. While we were walking around over the course of the day, we happened across a televised MMA tournament at one end of the boardwalk and a bboy performance down at the other. Then in the evening, the street performers were out, busking away. 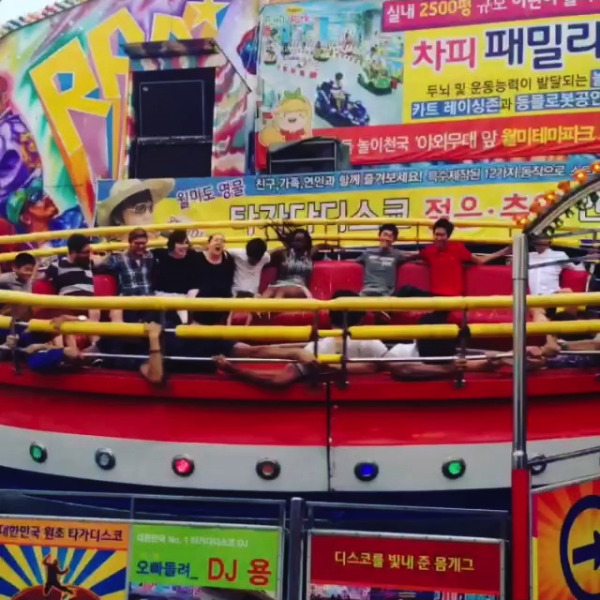 This ride is quite common in Korea, from amusement parks like this to the basements of buildings in areas with a popular night life. It spins, you have no seatbelts, and there's an operator who basically does everything he can to make you fall into the center by tipping it from side to side... Also, he's cackling and yelling at you the whole time. It is hands down one of the most dangerous things I have ever seen in my life. This did not, of course, stop most of our group of CDI teachers from immediately buying tickets and getting in line. For a video of this lawsuit waiting to happen, check out my Instagram feed -- I have a short clip of it in action, with my friends flailing around as they hung on for dear life. After that harrowing experience, everyone was ready to find the boardwalk and get some fresh ocean air. The overcast day made for a pretty seascape as we wandered around. The tide was in, submerging the railing on this small dock, and looking post-apocalyptic. Wolmido's monorail can be seen in the photo above, but for some reason it isn't running... So it's just sitting there, unused, looking semi-futuristic. In addition to the scenic view, restaurants, and cafes, the boardwalk also offers a ton of good old fashioned carvival games. Obviously, we couldn't resist the siren call of darts and air hockey. CDI teachers playing hard, with a guest appearance from my fellow Aclipse blogger, Serg! It took three of us throwing darts to win this stuffed dog. While there were plenty of restaurants that looked great, we were hellbent on eating street food and only street food. 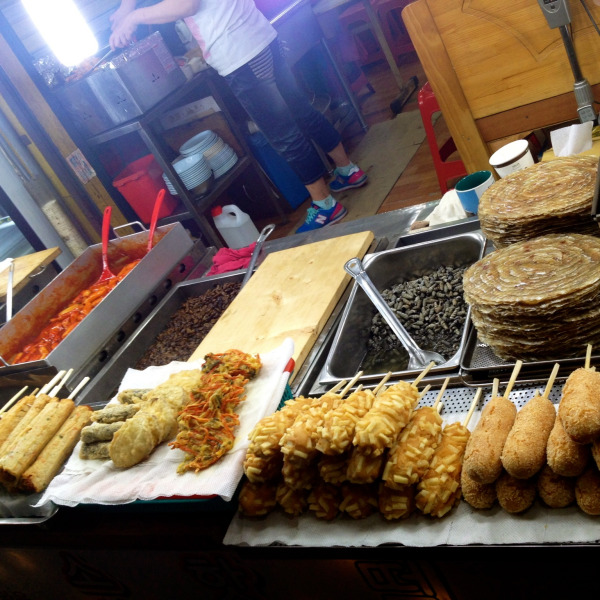 Conveniently, the food stalls were busy cooking up every served-on-a-stick item that we could want. Panoramic view of the coastline at dusk. The edge of the crowd gathered to watch the MMA fighting competition. By the time dusk rolled around, the boardwalk activites were starting to die down. 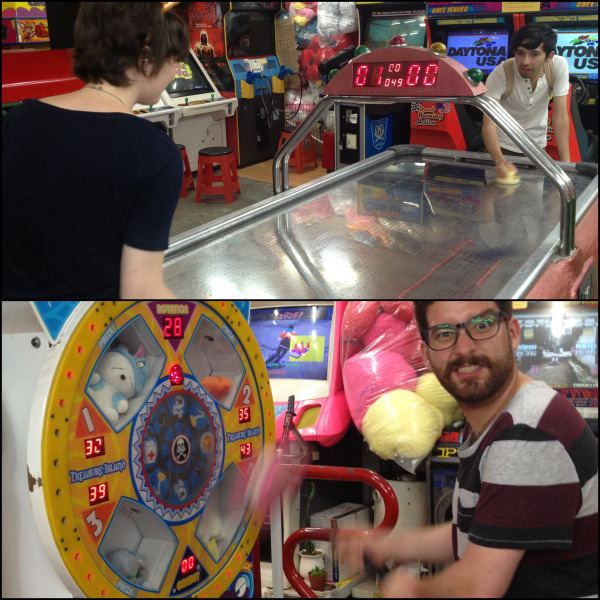 We walked through the amusement park some more, checking out their arcade and getting sucked into some games of Tekken 6. (Sadly, there was a distinct lack of skeeball on this island.) 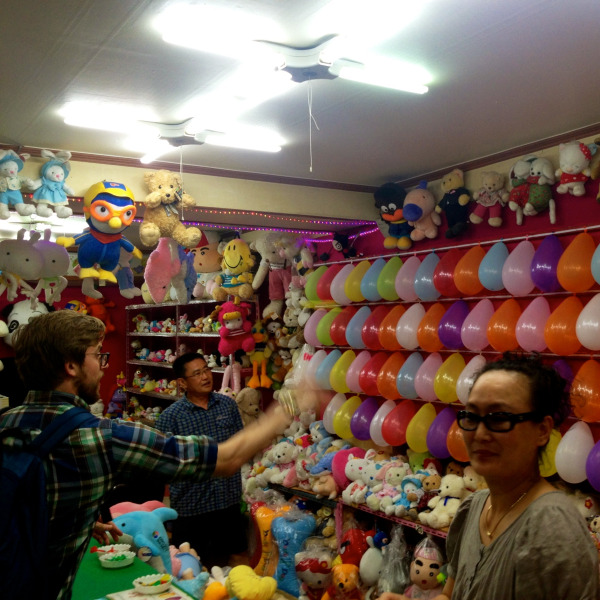 We checked out some other little carnival games, looked at what was being sold in a couple shops, and decided to call it a night. 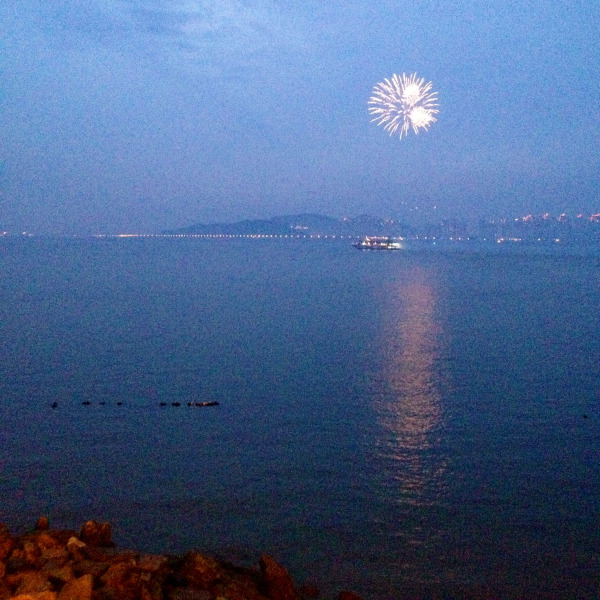 As we were leaving, a boat passing by on the water started setting off some fireworks, which felt like a nice way to end the day. 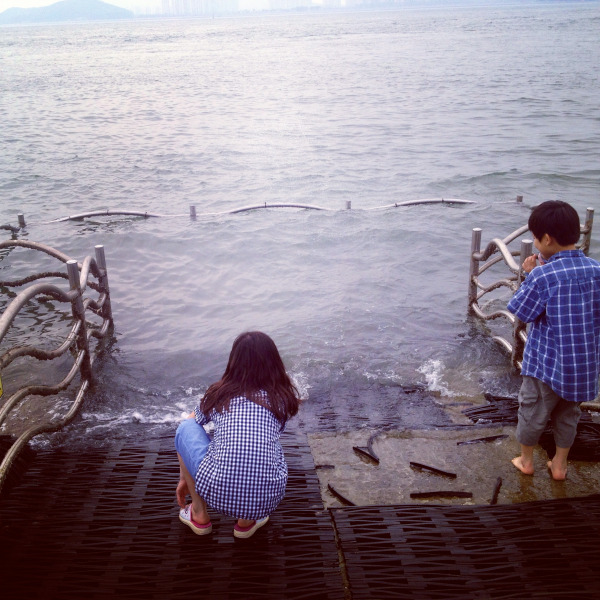 Wolmido is a great day trip from the greater Seoul area, or definitely something to add to your itinerary if you're exploring other spots in Incheon. To get to Wolmido, take the Seoul Metro Line 1 all the way to the Incheon-end: Incheon Station. From there, it's a short cab ride away! 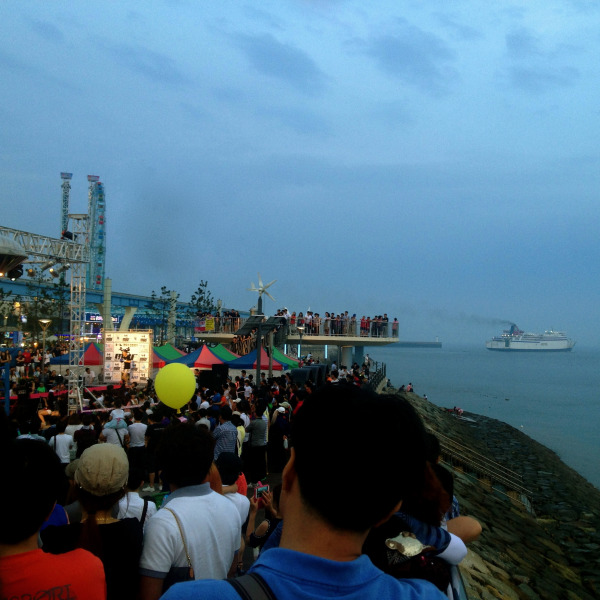 For more information / other options, see the Incheon Tourism site. Have you been to Wolmido? Are you a Disco Pang Pang survivor? Leave a comment below! 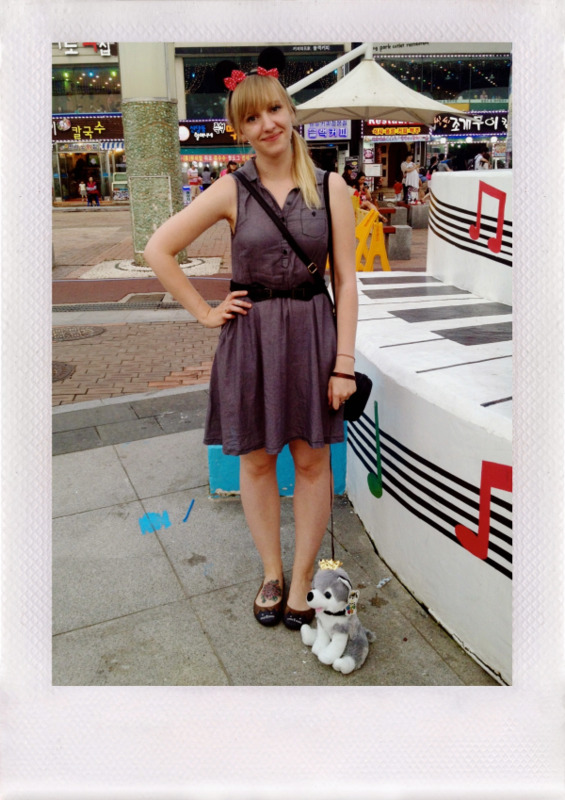 Between studying Japanese and Asian culture in university and setting her sights on a teaching career, it came as no surprise when Zannah Smreker announced that she was moving to South Korea to teach for Chungdahm Learning. In November 2011, Zannah accepted a position through Aclipse with the Yeonsu branch in Incheon, just southwest of Seoul. When she's not teaching, she keeps herself busy with exploring Korea, eating all the street food, and hunting down strange Engrish shirts. Check out her blog here for more of her adventures!